Tisha B’Av is not everyone’s favorite day, but it is one of mine- not because it is enjoyable, but because of what it represents. I like Tisha B’Av because of what it says to me about Jews- that we are a people that remembers and knows its past leads to a future. There are so many more Italians in the world than Jews. Yet no one laments for Rome. There are many more Greeks than Jews. The Acropolis and the Parthenon are tourist attractions, but does anyone mourn because of their destruction? Babylonia, Persia, Assyria, the glory of ancient Egypt- who remembers, who sheds a tear, who cares? I like Tisha B’Av because only a people that can weep will someday learn to laugh. And I like Tisha B’Av because I need it. 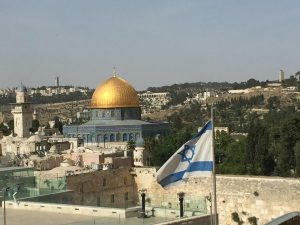 Is there a country more concerned about daily security than Israel, or one that has more bitter experience of friendly countries growing cold and distant at the slightest provocation? No other countries have to struggle daily over the sovereignty of their ancient capitals. No other countries are restricted in their right to visit and worship at their ancient holy sites in their own land. One of the main reasons for the original destruction of the Temple and our exile from our land- baseless hatred among Jews- still exists among us. Tisha B’Av is a good day to ponder unity and tolerance. I like Tisha B’Av because it contains a message of profound hope and faith. On this day, the Sages tell us, the Messiah was born. How profoundly insightful, how ironic, how just- on the day of destruction, redemption began. The end was also the beginning. “Give us joy in accordance with the days of our suffering”, the Psalmist says.